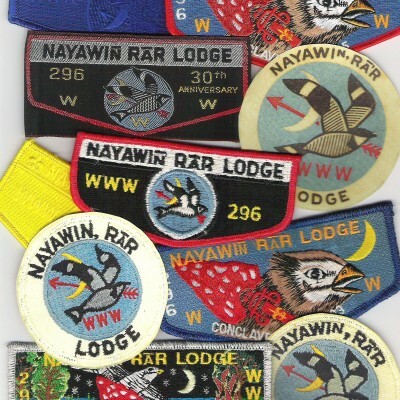 The history of Lodge #296 goes back to the latter part of the 1920's with the incorporation of the honor camper organization known as Ku-ni-eh. This was one of several camping organizations across the country developed to keep the interest the older boys in scouting. We have traced the use of this society to as early as 1926, although it may have been used earlier. This society was used until the formation of the Lodge in 1945 (there was a stipulation in the lodge charter that existing Ku-ni-eh members would automatically become lodge members). In 1944, a young executive from General Greene Council (Tali Tak Taki Lodge #70), named Bob Wolff, came to Tuscarora Council as Scout Executive. Mr. Wolff brought a rich tradition of the O.A. from Greensboro, where he had attended the 1938 and 1940 National Meetings. Bob began the quest to form an O.A. Lodge in Tuscarora Council. Through several correspondences with George Chronic and H. Lloyd Nelson, the paper trail had begun. On April 5th, 1945, the Camp Committee made the resolution for the installment of an OA Lodge in Tuscarora Council. On May 23rd, we were given approval from the National Council and on May 25th, approval for the National Lodge was complete. The Order of the Arrow had a Lodge affiliated with the Tuscarora Council in Goldsboro N.C.
Next, the lodge needed a name and totem. At the time the Lodge was being organized a group of arrowmen were meeting for the purpose of finding a suitable name for the Order of the Arrow's newest lodge in a building at Tuscarora's old camp near Goldsboro. The building was located near a campsite called Nighthawk Ridge. Finally, late one evening, several people were sitting outside and noticed the Nighthawks swooping across the deep blue sky in the moonlight. That was it!! The lodge totem was to be the Nighthawk in a deep blue sky on a moon lit night. With the help of a member of the Dept. of Anthropology at the University of Pennsylvania, a congressman and the library of congress, the name of the lodge was supplied as it is written in the Tuscarora language.